MedStar Franklin Square Medical Center is a not-for-profit 378-bed community teaching hospital located in the White Marsh section of eastern Baltimore County, Maryland. With more than 3,000 skilled professionals, including over 1,000 nurses and 400 staff physicians, MedStar Franklin is one of the largest employers in Baltimore County. MedStar Franklin has earned some of the nation's most prestigious quality awards and recognitions including Magnet Designation for Excellence in Nursing, the Delmarva Foundation Award for Quality Excellence, and inclusion in the U.S. News & World Report Best Hospital specialty ranking for three consecutive years. MedStar Franklin has provided quality neonatal intensive care (NICU) for more than 25 years and has more than 300 admissions per year. Its NICU is a Level III facility equipped with state-of-the-art medical technology and staffed by highly trained, compassionate caregivers. With many years of experience caring for babies who are born prematurely or become ill after birth, the NICU’s consistently high patient satisfaction rates reflect the quality of the multidisciplinary team members, who believe that a baby’s successful journey from critical care to home involves the entire family. 23 total beds, including 19 private rooms with accommodations for multiples, located directly adjacent to the Labor and Delivery unit. A family area in each room, with extra seating and pullout couches for overnight stays. A dedicated family lounge and reception area with kitchen and eating areas. Enclosed outdoor garden where families can spend quality time together in a safe and healing environment. Brand new construction featuring access to natural light, upgraded infrastructure, and advanced technology. A focus on privacy and tranquility. MedStar Franklin selected Unicel Architectural’s Vision Control® integrated louvers for the NICU’s interior doors and windows. Vision Control® is a patented, hermetically sealed glass unit combining louvers within glass that can be customized to virtually any shape for interior or exterior healthcare glazing applications. 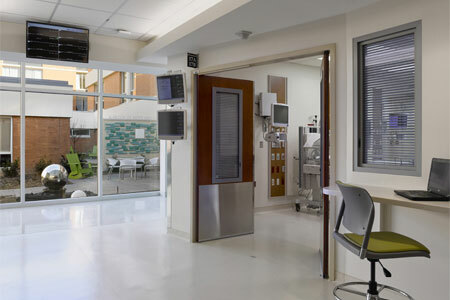 Its advanced louvered glazing technology eliminates strings, ensures alignment, requires no maintenance and provides the ideal privacy solution for ICUs, operating rooms, nurseries and more. Vision Control® is HIPAA-compliant and, when installed in exterior applications, significantly reduces energy consumption in support of LEED® requirements. Vision Control® is a winner of The Architects’ Choice Award from the National Symposium on Healthcare Design and a Product Innovation Award from Architectural Products Magazine. After several years of careful planning and construction for a spacious new NICU, patients and staff alike are responding most favorably to the new unit that opened in early 2016. More than doubling in size for its 23 beds, it provides 19 private rooms, ample natural light, and a variety of comfortable spaces with views to a beautiful garden beyond. Mothers and babies can rest in rooms that ensure privacy, yet still offer discreet options for monitoring by hospital staff via adjustable louvers. MedStar Franklin is raising the standard of care for infant and maternal health as the first hospital in Baltimore, and one of only two in the state of Maryland, to achieve the prestigious Baby-Friendly designation from Baby-Friendly USA.